The 2000W gennie, weighing 53 lbs, is perfect when your production needs a small, quiet, transportable power source. The 2000W gennie can safely provide 13.3A of power through its 2 120V outlets. Comes pre-filled with 1 gallon of gas which provides your production 8 hours of power. No need to fill it up upon return either, but you might need to rent a gas can (empty) for refilling if you want to keep the power flowing for longer. Turn the side dial to the on position and move the choke into the direction indicated by the arrow. 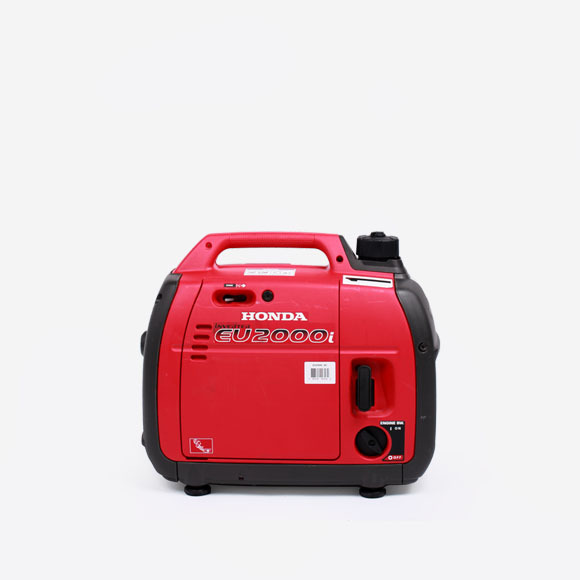 Pull the pull cord quickly until the generator starts to operate. Slide the choke throttle back the other direction until it sounds like the unit is operating normally. Make sure the valve on top of the gas cap is set to on, which allows air flow to the gas tank. Turn the side dial to the off position.